Mechanical-Drive Riding Trowel is ergonomically designed. Intended for large and small contractors, Mechanical Super Pro (MSP) 470 is powered by 44Â hp, air-cooled Kubota diesel engine and offersÂ hydraulic power steering with independent manual pitch controls. Raised operator platform and hydraulic joystick steering lend to ergonomics, and two 46 in.Â dia, 5-blade, non-overlapping rotors operate at speeds to 180 rpm. Other standard features include torque converter clutch system, heavy-duty gearboxes and Spiders, and electric powered spray system. The Allen MSP 470 is a totally new Hydraulic-Steering, Mechanical-Drive Riding Trowel in the Allen riding trowel line-up. The powerful diesel engine, patent-pending torque converter clutch system, super heavy-duty gearboxes and Spiders provides a great weight-to-horsepower performer for large and small contractors. This new workhorse features a raised operator platform and comfortable hydraulic joystick steering making this one of the most ergonomically designed riding trowels on the market. The MSP 470 is the latest addition to Allen’s Mechanical Super Pro (MSP) Series of Riders. You can see the MSP470 rider as well as the entire Allen product offering in Booth #030628 at World of Concrete which will be held at the Las Vegas Convention Center in January 2014. Allen Engineering will also be exhibiting at the Rental Show (Booth #5973) at the Orange County Convention Center, Orlando, Florida in February 2014 as well as ConExpo (Booth #5024) at the Las Vegas Convention Center, Las Vegas, Nevada in March 2014. Allen Engineering Corporation (AEC) is headquartered in Paragould, Arkansas USA. The company designs, engineers, manufactures, and markets concrete and related equipment with a number one goal of Total Customer Satisfaction. Allen Engineering Corporation is family-owned and their Allen Equipment is American-Made. 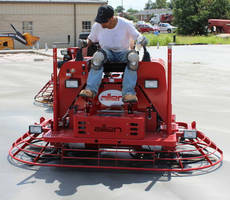 Allen Equipment is sold through a network of “concrete-focused” dealers and rental centers around the world. For more information, visit the AEC web site at www.alleneng.com.